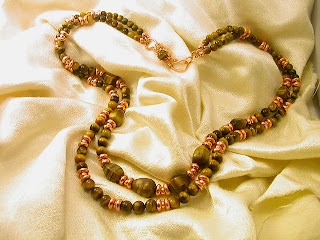 Copper wire Sculpted Tiger Eye cabochon and necklace. Pendent is Large and sculpted of 18 ga round copper wire. 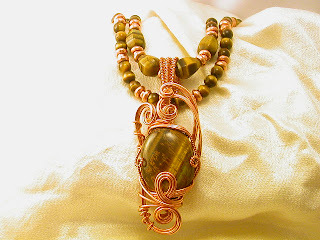 Three strands were formed by hand around the Tiger Eye Cab. I really love this beautiful piece of gem material... it has lovely chatoyancy and a tiny glimmer of greenish color along one side. The bail is very large and pendent taken off and necklace worn alone. Hand formed copper donut beads, handcrafted S clasp closure.